Lying in my tent before falling asleep, the sight of the festival grounds neatly zipped away, I still hear the layers of music filtering in. Earlier in the evening, in groups scattered among the campsites, so many fiddle and banjo players are going at once—countless lines and runs of notes played by people who haven’t sat down together in weeks or months, meeting each other in the music with skill and energy and joy. A while later you might get it in triple stereo—one tune from over there by the big pine tree, another from past the porta-potties, another from the band contest on the stage over the hill. Trying to listen to all the tunes at the same time is a particular pleasure. Maybe there’s a family band practicing for the folk-song contest, and maybe this is the last time I will ever want to hear that folk song, but there’s still something tuneful and sweet in their rendition, and soon enough the family will go to bed, and the many sets of people playing will give way to one lone group playing big rowdy tunes with big bawling vocals, until there’s only the night quiet and the rustle of people moving around in a toward-bed way or a get-up-to-pee way, and the night insects making their own music, and all those sounds make it possible to imagine how the sky and the stars look, how I lie inside the shape of everything around me. You could argue that my tent might as well be sitting on any patch of ground in the country. And maybe it could; fiddler’s conventions similar to the ones I’ve attended in North Carolina and Virginia, where people gather to play old-time Appalachian string-band music, happen across the United States and beyond. It’s close to the bone. It puts them in a place, and I think a lot of what they feel is that connection to a place. . . . If I were going to learn some other music from another completely different culture, I would want to go there, but if I couldn’t go there, I would want to hear somebody play that music who was very grounded in that place. Music can be both an expression of connection to place and a reason for gathering in place: a double kind of common cause, a community repeatedly manifested in summer weekends in county parks, cow pastures, and ball fields, made by the collective desire to sit down on a hopefully not-too-uncomfortable camp chair and get lost together in some tunes, the kind of getting lost that’s more like feeling found. Reish told me he hopes to include in Spring Fed’s catalogue work representing the increasingly broad range of music being played in Tennessee and nearby. “Moving forward, I would like to see Spring Fed embrace more of the diversity of this region as it has changed in recent years—the Latin American music, the Kurdish American or Indian American music that’s being made here. If we consider ourselves a documentary label, devoted to the home-grown, grassroots music of this region, it’s high time,” he says. Music can be both an expression of connection to place and a reason for gathering in place: a double kind of common cause. An understanding of the ways humans have related to places and landscapes is a paltry one without that kind of expansive listening. But it often requires access to recordings, and our access is, inevitably, incomplete. Unique versions of tunes that have been learned and passed down from player to player in specific communities, known only by a few folks; archived field recordings; thrift-shop 78s—all huge swaths of audio history that could easily end up gone forever. For that reason, it’s worth celebrating record labels, such as Spring Fed, that make it their business to document music being made now, and to find and release endangered or rare recordings. In Atlanta, Dust-to-Digital produces exquisite, highly crafted and superbly documented albums, often accompanied by books and ephemera, that bring obscure but important music back into listening range. From Thai country artists to old-time banjo player Ola Belle Reed, the label’s releases reveal an eclectic and far-ranging taste that’s consistent in its desire to save what might be lost. And in Hillsborough, North Carolina, Music Maker Foundation focuses not only on historical and new recordings of blues musicians, but on helping living artists to access good housing, health care, musical instruments, and other resources. For artists interested in continuing to perform—or beginning again after years away from it—Music Maker sponsors concerts in the local community and around the country. We’re happy to be featuring Music Maker and Spring Fed, along with the Alan Lomax Archive, in our first audio supplement. 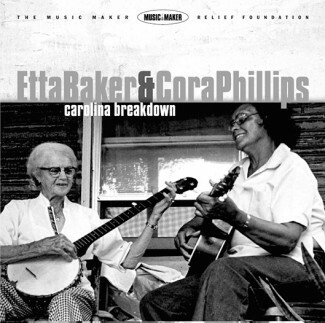 It’s called “Five Songs,” and it is what it sounds like: there’s a track from the late, much-missed Piedmont blues guitarist and banjo player Etta Baker, from the album she recorded with her sister Cora Phillips, and one from a blues player who continues to perform today, Ironing Board Sam. We’ve also included two songs from a special section this issue, One-Track Mind, in which we asked working musicians and writers to talk about their favorite songs. Alice Gerrard, renowned for her pioneering bluegrass recordings and performances, and the founder of the Old-Time Herald, considers the ballad that first pulled her into the world of old music: Texas Gladden’s “One Morning in May.” Dom Flemons, the songster and banjo player formerly of the Carolina Chocolate Drops, talks about hearing and re-­hearing a recording of Nathan Frazier and Frank Patterson’s “Po’ Black Sheep,” and about reclaiming and reasserting the African roots of old-time. And poet and musician shirlette ammons, who recently cofounded a new label, SugarQube Records, recalls Booker T. and the M.G.s’ classic “Green Onions.” You can hear “One Morning in May” and “Po’ Black Sheep” in the supplement; “Green Onions” can easily be found online, and after reading ammons’s essay, you’ll want to give it a fresh listen even if you’ve heard it many times before. Our fifth song is a phenomenal recording, produced by Grace Barcheck, of the music made by an Antarctic glacier. It comes our way via the explorations of longtime Ecotone contributor Kathryn Miles, whose essay, “Mapping the Bottom of the World,” considers the sounds the Earth makes. Along with songs, and writers’ explorations of them, we have photographic representations of music: Sarah Bryan, the present-day editor of the Old-Time Herald, shares images from her collection of found photos of musicians. Some hold their instruments like badges of pride, and some are shown in the midst of playing; all offer fascinating testaments to earlier times. Finally, we feature a couple of pieces that consider the attempted erasure—and the attempted conservation—of Native languages in North America. Megan Snyder-Camp digs into the history of Thomas Jefferson’s Indian vocabularies, as he called them—tables of words and definitions recorded by white people Jefferson commissioned, among them Lewis and Clark. And Luzene Hill tells of how she began to bring her Cherokee ancestry and culture into her practice as a painter and illustrator, most recently in the making, with letterpress printer Frank Brannon, of a limited-edition book, printed in Cherokee from newly cast type in the syllabary created by Sequoyah in the nineteenth century. Here in North Carolina, the season’s chill has caught up with us at last, and there will be no more playing tunes outside for a while. But it’s good to remember those summer evenings. When I talked about them with my partner recently, he said one of the things he likes most is how the music, coming from so many directions, becomes like something of the natural world—like crickets, like cicadas, utterly present and all-pervasive. As for me, I’m making it a goal this year to spend more time staying up late and playing, to crawl into the tent only when the strains of the last band going can be heard from somewhere across the field. In the meantime, I hope you’ll set a spell with us and listen, or imagine listening, as the work in this issue compels us to do.